We'll discuss an example of a part's main page here, highlighting all the useful information that you may need when you've found an interesting part. The Part's Submitter details the designer(s), the group (iGEM lab or team), and when it was submitted. The Part Status Box shows the status and availability of a part's sample. Possible statuses include: In Stock, It's Complicated, Not in stock. It also shows the number of uses and twins the part has. The Get This Part page will show the physical location(s) for a part and a summary of its quality control results. If you've found an interesting Available part you'll want to click on this page before requesting parts. The Short Description is usually the biological or technical short hand of the part. Ex: promoter (lambda cl regulated). The Description is a general section, where you may find a biological or technical description of the part, the suitable requirements the part needs to properly function, and any data or characterization from experiments. 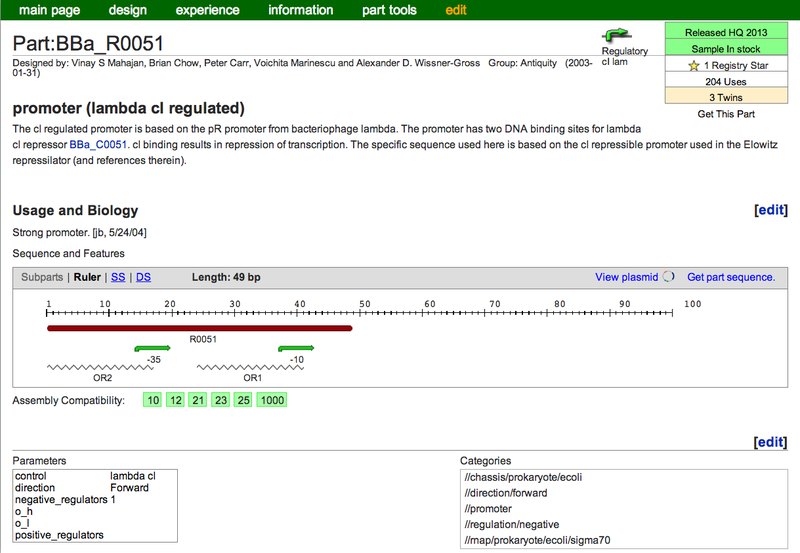 The Sequence and Features Box may be displayed on the Main Page. See below. The Parameters box displays the submitter-decided parameters for the part. See the Information page for more information. The Categories box displays the submitter-decided categories for the part, which affect its organization within the Registry's Catalog. See the Information page for more information.